A stunning curler from outside the box by Philippe Coutinho secured a major home win for Liverpool against Manchester City. The victory keeps alive Liverpool's hopes of securing Champion's League football via a top four finish, but City's chances of retaining the Premier League title look slim after this result kept them five points behind Chelsea, with the League leaders still having a game in hand. The identity of City has changed a lot in recent years due to the increase in their financial power, as has their trophy cabinet as a result, but one thing which has not changed is the club's fortunes against Liverpool at Anfield. Before this game, they had only managed one win in their last 17 visits to the Reds, and despite Liverpool lagging far behind City in terms of points prior to kick-off, nothing would change here. Liverpool started a little sluggish in defence but soon came to life, and after a few minutes Adam Lallana thought he had put the Reds ahead, only for his strike to be ruled out due to an offside decision. Fortunately, Kopites did not have to long wait long to celebrate for real: less than 11 minutes into the game, a sweet strike by Jordan Henderson (captaining once again in the absence of Steven Gerrard) went in with a little help from the underside of the crossbar, and Liverpool were in front. It was another sign of Henderson's growth as a potential future captain, and goals like this mark a nice resemblance to Gerrard and his habit of providing stand-out moments of quality in big games. Mind you, as encouraging as this was, it would only retain its power if City were kept abay. Alas, after knocking on the Reds' door a few times, the titleholders equalised on the 26-minute mark with a straight finish by Edin Dzeko, although the manner in which City were able to carve open the opportunity gave a reminder to manager Brendan Rodgers - or The Brodge, as nicknamed by Noel Gallagher recently on Match Of The Day 2 - that whilst his side's fortunes have improved in recent weeks, his defence is still prone to the occasional bout of jitters. Liverpool's defence remained quite shaky for the rest of the half, but they hung in there and, in the second half, the game became a more open affair on both sides, as each team took it in turns to create good chances, some - including more than one effort by Sergio Aguero - being only a whisker away from going in. Lallana actually had the ball in the net for the second time but, for the second time on the day, an offside flag made it obsolete. It looked like anybody's game, although the neutral would have assumed by the passage of play that City would be the team to find a way through if either side was to secure three points. Instead, with just over 15 minutes left, Coutinho set himself up with a touch and right-footed it around Joe Hart high into the net. 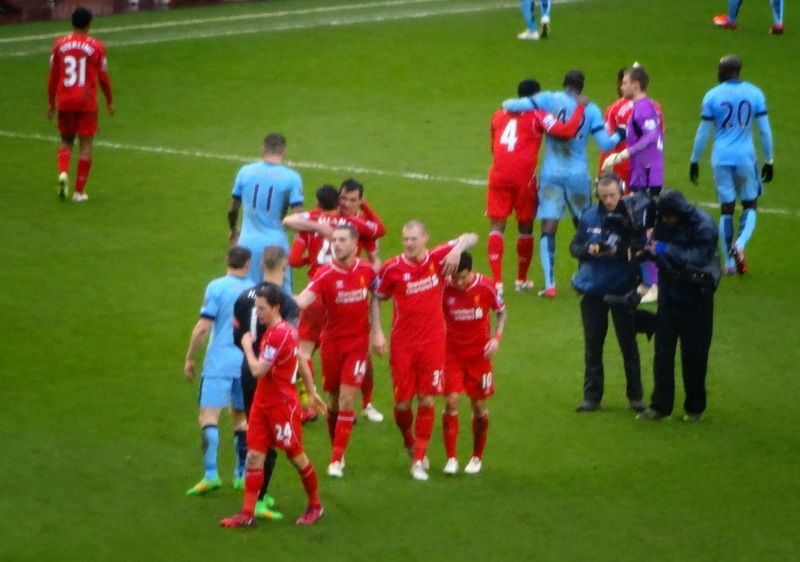 Anfield was bouncing; once again, the underdogs were ahead, and this time they would not let the lead slip. City continued pressing for another equaliser, and brought on Frank Lampard in an attempt to somehow get that second goal. But time was not on City's side and, with the Reds focused on denying their opponents the slightest chance at earning a point, Liverpool held on for what stands as their biggest win of the season. Although nothing could equal the electricity and emotion of Liverpool's 3-2 win over City last April, this result came close. The reactions of the Anfield faithful indicated how important this win was in proving Liverpool's revival is for real, and puts Rodgers' team just two points behind fourth-place Manchester United. After this defeat, Manuel Pelligrini will privately realise that it will take more than a slip-up to keep the Premier League title at the Etihad this season. For Brendan Rodgers, though, this win must have been extremely satisfying: whilst it has looked like Liverpool have been on the right track for a good few weeks now, this milestone victory proved it, and ensures that the Reds will have a busy two months on the horizon as the 2014/5 season comes to a close. Next up is Burnley: ahead of that game, the message for Liverpool after this win has to be: "We Go Again".